I'm pleased to report we'll once again be running a contest to guess Wine Spectator's Wine of the Year before they announce it. This post serves notice that entries for Scoop the Spectator 2013 will open here on Monday, November 4th 2013 at 9:00 am. We're playing for a $200 Amazon.com gift certificate courtesy of New York wine retailer Grapes the Wine Company. So start your research now and get your entry in early because the first person who guesses a specific wine "owns" it. Trying to guess the top wine is fun, but my favorite part of the contest is learning about a wine that's going to skyrocket in value once chosen. Last year's wine -- the 2008 Shafer Relentless -- was a $60 release price wine that now sells for over $200 (if you can find it). Fortunately, that wine was a rare case where the follow-on vintage also scored 95 points and is still somewhat available at or near release price. Hopefully we'll find some actionable values from highly rated wines they've identified this year. I was just doing some research and spotted a couple QPR benders I hadn't noticed before like the 95WS/$37 2011 Bedrock Heritage and the 98WS/$60 2009 No Girls La Paciencia Vineyard Syrah. Style points will definitely be awarded for those who share actionable value alerts for wines you've actually tasted! Wine Spectator likes the idea of a contest surrounding this so much they're running their own contest this year. If you guess the winning wine on their site you get entered in a drawing for tickets to one of their grand tastings. Submissions here on the WWP have successfully identified the winning wine all three years we've run the contest so I'm confident we'll be able to do it again! Here's a link to last year's contest to give you a feel for the format. Remember: Check back Monday morning when a new post will appear here where you can submit your entry as a comment on a post that will appear at 9:00 am eastern. Subscribe to The Wellesley Wine Press to be informed of updates as the contest progresses. Looking forward to another great year! A while back I wrote about Amazon Payments and how it can be used to settle up financially with friends when splitting a wine purchase. Square Cash makes it even easier. I've been experimenting with Square Cash since it came out last week. It's clear the service is obsessively focused on making it as simple as possible to transfer money from one person's checking account to another. The design is so minimalist it makes you wonder whether it'll really work - until the money is effortless deposited into your checking account and you wondered why money has been so hard to move around for so long. 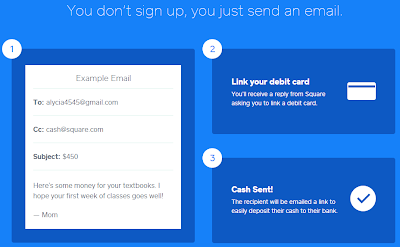 In its simplest use model you send an email to a friend, cc: cash@square.com and include the amount you want to send on the subject line. I doubt anyone will be convinced this works right out of the box so I suspect many will, like me, download the app (iPhone and Android are supported) to trigger their first exchange. But the apps just populate an email so after a while I suspect we'll become comfortable with sending money via email. As a sender, you provide Square with your debit card number, expiration date, and zip code. The recipient is notified of your generosity via email then the money gets deposited in their account once they provide a debit card number or ACH information associated with their checking account. The money is then transferred with in 0-2 days. In my early trials, transactions took less than a day. In some cases they money was there almost instantly. The sign-up process with Amazon Payments is quite a bit more involved with occasionally cryptic error messaging that makes it unclear what's wrong with the accounts involved. Square Cash is a lot simpler in this respect. There is no Square Cash account per se - you just send money via e-mail and they try to stay out of the way. The killer feature of Amazon Payments is how credit cards can be used with no fees. This provides an opportunity to rack up points and miles via credit cards transactions. Some debit cards provide cashback or airline miles however, so if you can combine these with the ability to send money to friends it's a really compelling service. But either way, Square Cash is my new favorite way to send money to friends to settle up for wine purchases. Shout out to my pal JF for the heads up on this service. Limits are $250 per week until you provide the last 4 of your social at which point it bumps up to $2,500 per week on a rolling basis. That's enough to accommodate some serious wine transactions! Scoop the Spectator 2013 is coming up! We'll be accepting entries here starting Monday, November 4th. Subscribe to the site to keep up with posts leading up to the contest. We'll once again be giving away a $200 Amazon gift card. One of the first wine accessories I ever used was a gift from my younger sister. It was a Screwpull brand gift set that included a corkscrew and a foil cutter. I never got used to the corkscrew portion of the gift set, but the foil cutter served me well for over a decade . Unfortunately it recently broke. The plastic just just snapped at the apex while I was using it and that was the end of it. I went a few weeks without replacing it because I wasn't sure whether it was a necessary accessory. 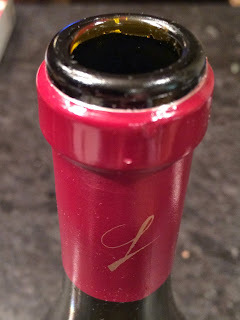 If you're not familiar with what a foil cutter is useful for, it's for cleanly severing the foil capsule that covers the top of a corked bottle of wine. 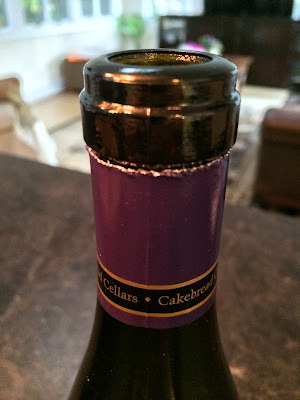 If you don't have a foil cutter, your options are to either peel away the foil capsule altogether, cut it away with the knife that's sometimes built into a corkscrew (which is a little more difficult than using a foil cutter and sometimes results in jagged edges on the remaining foil), or (if the capsule is a little loose) you can just slide it off. Keeping the majority of the capsule on the bottle is purely an aesthetic preference. There's absolutely nothing wrong with tearing the capsule off. I just like the way a bottle looks with the foil cut around the opening. After a while I started to miss having a foil cutter. I was perfectly happy with my Screwpull so I looked for them on Amazon and found them for around $10 shipped. I noticed some of the reviews saying they "didn't make them like they used to" so I was wondering if I should buy another Screwpull. Looking a little further I noticed that Screwpull and Le Creuset are the same company and evidently always have been. It looks like Le Creuset is branding more of their wine accessories as their own and the Le Creuset foil cutter gets good reviews on Amazon so I went for the Le Creuset. It arrived a couple weeks ago and I've been using it since. It feels every bit as good as the last Screwpull that lasted a decade. The Le Creuset may even be a little sturdier. I'd recommend adding a foil cutter to your collection of wine accessories. They're small and provide a fast and easy way to nicely open, present, and enjoy a bottle of wine. I'd give this one a full 5 out of 5 stars. Update: Read this post for some further commentary on where precisely a foil should be cut.